Description: Subject is the sister of Jason O’Conner, a.k.a. Warrior Guyver and/or Dreadnought, who he had thought dead since the start of the Chronos war but later discovered that she had instead been kidnapped by Chronos and turned into an Overlord. Her Brother managed to save her by bonding her to a prototype Turbo Guyver Unit and she became known as Psi Guyver until she became infected with what is now known as the Darmon crystal. Which turned her into a monstrous being called Crystallite that forced Dreadnought to remove all of her enhancements in order to free her. Rendering her completely human but near death by her ordeal, Dreadnought used the prototype Black Nova Unit he had acquired from an alternate reality to save his sister once again. Now known as Black Nova Guyver 2, Jenny O’Conner continues to fight Chronos and all enemies of humanity but has left ACTF. -Physical strength: Subject possesses the strength of 1,000 men and has nearly unlimited stamina due to a quantum singularity, which is the primary source of this Units immense gravitational power. -In place of Units Hyper Sensors, the subject has a polymorphic material that normally takes the form of long red hair, due mainly to host willing it to that shape and colour since the units norm is greyish white. The subject can use this hair as whip like vibrational sword weapon, with a variable range that has been known to reach up to 15 feet. 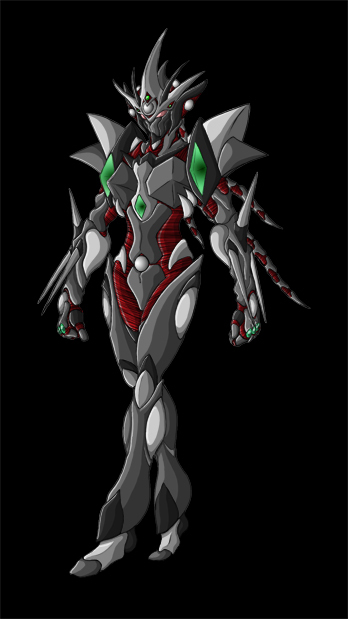 Though subject doesn’t have standard Guyver hyper preceptors, the subject has been observed to be able to detect enemy movements for a range of 1 km (~3282 Feet) and has shown enhanced sensory perception from human norm. The subject can also use the polymorphic material to fire a hail of dart like vibrational strands in almost any direction and is often used in tandem with units head beam. -Speed: Subjects has a reflex speed that ranges from 50 to 400 times normal, a top ground speed of up to 2,000 MPH, and a top air speed of 15,000 MPH.